At Acutedge, we strive to stay up to speed on the latest technology and Salesforce advances to continuously increase our effectiveness as Salesforce consultants. That’s why we attended the Salesforce Lightning Now Tour in New York City, New York this June. Our team has already been using Lightning App Builder and other features of Salesforce Lightning Experience both internally and for our nonprofit and business implementations. Even so, we were amped to gain insights and hear the tips and tricks from Salesforce to fully leverage this cutting-edge technology. What is Salesforce Lightning Experience? Lightning is more than just a next-level User Interface change from Salesforce Classic, it’s called Lighting Experience because it includes an experience, a framework, and an entire ecosystem comprised of the Salesforce Community and AppExchange. Nowadays, users expect more from business applications than ever before. Salesforce Lightning Experience provides rich, interactive experiences, intelligence, and automation. Salesforce implemented over 700 features, front-end and back-end, specifically designed to drive and accelerate productivity. The Salesforce platform has evolved from a classic data entry and management tool to a workflow productivity hub with a reported 41% increase in productivity. You might be worrying that you won’t how to find your way around Lightning Experience, but we’ve got some pointers from the tour to help you dive right in. In order to maximize productivity and performance on any technology platform, it is imperative that users access and manage data easily and quickly. The Lightning App offers a customizable navigation bar, different navigation styles (Standard vs. Console), global search capability, and a customizable utility bar. The utility bar is a consistent footer with allows for quick access to a wide range of actions and quick links to Chatter, recent records, creating notes, or even making phone calls and automatically logging them with the Lightning Dialer. 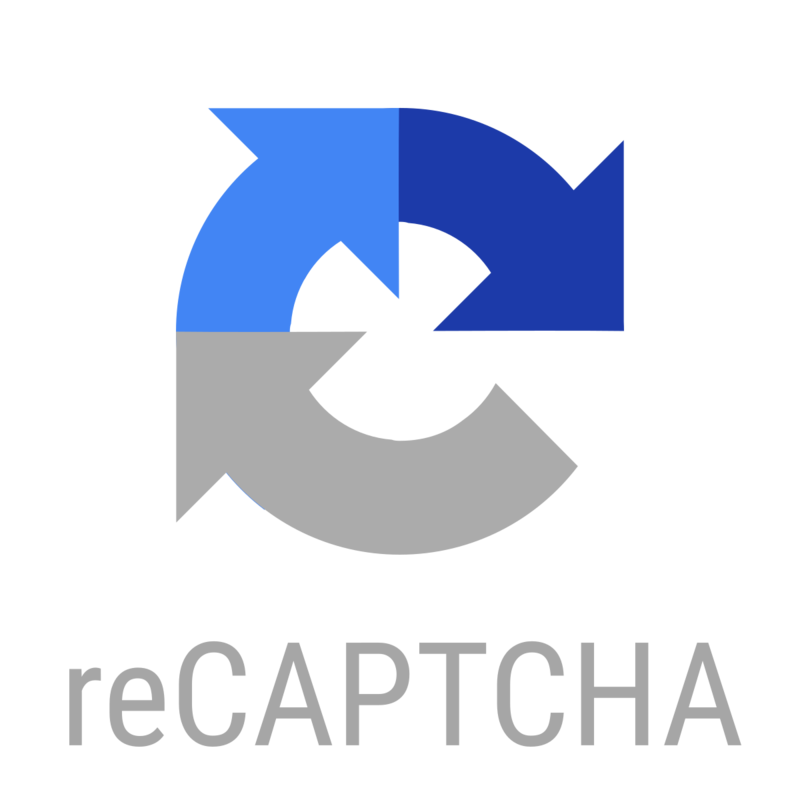 Global Search, Favorites, Global Quick Actions, User Assistance Setup, Notifications, and User Menu are included in the Lightning Experience Global Header. You can set up custom themes and branding in your Salesforce organization to change the color and logo of the global header, as well as the background that lies behind all pages of your App. You can choose from a variety of themes Salesforce has provided, or customize the colors to create your own! While Salesforce Classic included a global search bar that showed instant results as you type, the Lightning Experience global search shows you instant results of recently viewed records across all objects when the search box is selected. In Lightning Experience, you can also refine search results by selecting the item to display in the instant results for before you begin your search. In the full search results in Lightning, you see Top Results, which lists the most frequently used objects. You can change the object to see more results or refine your results with column heading sorting or the sort menu. The navigation in Salesforce Lightning is the unsung hero of the new User Interface. Drop down menus next to each record tab allow you to instantly navigate to a list view, favorite record, or create a new record right from that tab! As of the Spring ’18 Release, you can personalize the navigation bar in Salesforce Lightning Experience. Individual users can now reorder items, rename or remove items, or add more items to their personal Navigation Bar. In Salesforce Classic the navigation bar was limited to object-specific tabs (i.e. Contacts) or Visualforce pages. Now, in Lightning, tabs can be applied to dashboards, list views, reports, or even specific records. Additionally, you can enhance user navigation by popping out pages [1-2] to a temporary new tab. Temporary tabs provide easy navigation while you are working on a specific task directly within Salesforce. For more permanent access to a specific record, list view, report, dashboard, etc. you can select to add the temporary tab to the “Nav Bar” [3-4]. Gone are the days of click-click-click to get to the right list view! While Standard Salesforce Navigation is object-based, the Salesforce Console navigation style is record-based to keep your work focused. In Salesforce Console, records open in tabs and related sub tabs to create a work space of data. The Console App navigation is an excellent option for Service teams because it is optimized for users that only need to access a limited variety of records. As a bonus, your tabs are persisted so you can log off at the end of the day and then start your next day exactly where you left off. In Salesforce Console you can also “pin tabs” to your navigation bar like bookmarks to always have a direct link to the pages you need. 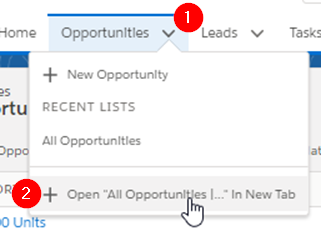 Navigation bar customization, alongside the Lightning-only feature of Favorites, gives your users the freedom to create shortcuts to their top Salesforce pages to suit the unique way they work. The Lightning Framework extends the Salesforce platform using a component framework that increases efficiencies of admins, developers, and end-users alike. 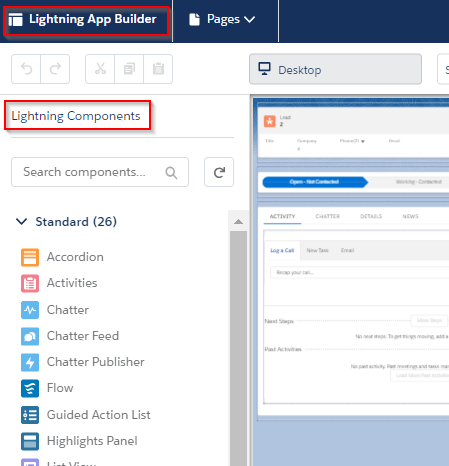 The Lightning App Builder provides the functionality to build (from scratch) or customize existing desktop and mobile application pages and modify component properties, without code! Admins use the drag-and-drop builder and reusable configurable“components” to customize the look, feel, and function of Record Pages, Home Pages, and App Pages. Standard Components are the base building blocks of the Lightning UI built by Salesforce. Standard Components include items such as the Activity Composer, Record Details, Report Charts, Related Lists, List Views, and Visualforce Pages. Custom Components are those built by customer developers and only limited by your imagination (and code skills). Custom (Managed) Components are AppExchange Components built by Salesforce Partners and available on the AppExchange. The AppExchange is the ecosystem that drives customizations readily available to Salesforce users and admins. In Salesforce Classic, you were confined to static record detail pages where the most flexibility came from assigning page layouts by profile or record type. Now, in Salesforce Lightning Experience, you can use dynamic lightning pages to customize the layout of a page real-time as the record and/or user changes. 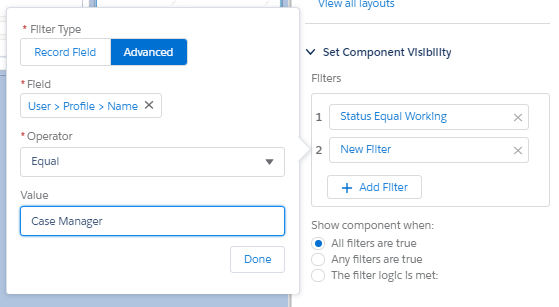 Component Visibility lets you add filter conditions and logic to show/hide a component on the Lightning App pages based on record data, related record data, or the current user context including Role and Profile. Display the related list of Open Opportunities on the Account page only if the client has an open pledge. Show a related list of Donations on the detail page for Donors & Constituents if the current user is a member of your Fundraising Team. One of our favorite ways to leverage component visibility is to create an “on-screen alert” with rich text or simple HTML using the Rich Text component. For example, you can display a text alert to follow-up with a Lead if the last activity was more than 30 days ago. Although standard Salesforce Workflow Rules trigger email or task alerts, component visibility allows for on-screen alerts to the user right on the record page. Increase user productivity by avoiding information overload and presenting only the components your users need at the time they need them. To Lightning or not to Lightning? If you’re still on the fence about migrating to Lightning, don’t be! The future is Lightning, and the time is now! If you’re migrating from Classic to Lightning our Acutedge Salesforce Consultants will help you utilize the Lightning Migration tools, assess your Lightning Readiness Report, create a roll-out strategy, and help you make the transition as seamless as possible. If you’re new to the Salesforce platform, our consultants provide training and customization to bring your cause to the cloud. Overall, the Salesforce Lightning Now Tour workshop for Admins was very informative and enlightening. We’re sparked with so many bright ideas on how to use Salesforce Lightning Experience features for our customers, it’s electrifying! If you missed the Lightning Now Tour, all the workshop materials are available free for anyone who wants to learn more about Salesforce Lightning Experience and how to bring your organization into the future. Interested in learning more about Salesforce Lightning Experience and staying up to date on new features? Join the conversation with the Lightning Now Community or contact us to get started! Briana Lamet is an experienced Salesforce consultant, certified Salesforce Administrator, and education enthusiast. Briana has a background in Mathematics and Computer Science and loves learning and implementing new technologies for her clients.